Nearly all of the millions of people who holiday in Hawaii each year come to Honolulu. Home to the state's largest airport and its largest port, Honolulu is the transport hub of Hawaii. Far from the quiet and isolated resorts that many associate with the islands, Honolulu is a bustling city of nearly a million people. Honolulu is Hawaii in microcosm. Visitors can spend their morning paddling a kayak or taking a surf lesson, shop 'til they drop in the boutiques of the Ala Moana Center, and attend a luau or take in a show at the Polynesian Cultural Center in the evening. 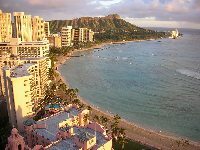 The city itself has many attractions, and visitors will enjoy visiting the Waikiki Aquarium and Honolulu Zoo (both in Kapiolani Park), peering into Diamond Head Crater, and having fun on one of the many stunning beaches in Waikiki. Honolulu is home to many excellent restaurants, a lively nightlife, and enough souvenir shops to satisfy even the most avid bargain-hunter. The hustle and bustle of the city may not be everyone's idea of a romantic holiday in Hawaii, but a few days in Honolulu is a must on any island getaway.